Blushing cherry blossom blooms with fragrance to produce a blissful and radiant scent. 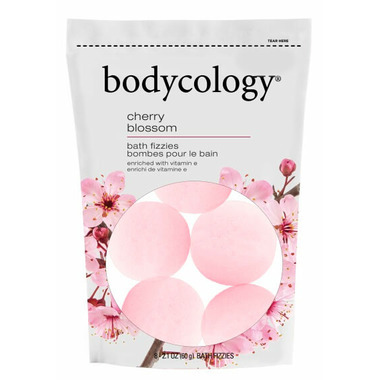 Enjoy a fragrant, moisturizing soak with Bodycology bath fizzies. Each fizzy adds fragrant effervescence to your bath while delivering skin moisturizing vitamin E.
Usage: Add 1 to 2 bath fizzies to warm bath water and enjoy. Ingredients: Sodium bicarbonate, citric acid, sodium sulfate, fragrance, water, glycerin, tocopherol (vitamin E), Red 33 (CI 17200), Yellow (CI19140), benzyl salicylate, hydroxyisohexyl 3-cyclohexene carboxaldehyde, benzyl benzoate, butylphenyl methylpropional linalool, alpha-isomethyl ionone. Caution: For external use only. Use only as directed. Excessive use or prolonged exposure may cause irritation to skin and urinary tract. Discontinue if rash, redness or itching occurs. Consult a physician if irritation persists. Keep out of reach of children, except under adult supervision. Very pleasant scent, I just used 1 at a time and that was enough. The bathroom kept the scent for a few hours after the bath was over! Creamy, soft feel on your skin. Well worth the price.